The detail at the top of the blaster. I’ve tried making the rough shape and doing Intersect faces, but the whole thing is a curve and I can’t figure out how to make the shape with the curve and everything. The curvy bit on the back of the handle. I have no idea how to make it shaped like that. It’s curved but at a weird angle and some other things that confuse me. Not sure how to approach it at all. My current model has a very blocky handle, but I need it to slant in at the back like how it does in the reference image. I drew a line where I want it, but I wasn’t sure where to go from there. This is the first time I’ve used SketchUp, so it’s possible I’m just missing a feature that should make this super easy, but I just have no idea how to approach it. I’ve tried making similar shapes and use the intersect faces tool, but I can’t get the right shapes to begin with. It all has to do with being unable to push/pull on curved surfaces, I think, which has been quite a hurdle for me so far. Here’s an annotated picture showing what I’m talking about because I have no idea how to accurately explain what I’m talking about with just words. Also I want to get the grooves in the hilt as well, and I’m not sure if that’ll be complicated or not. I was going to do that after getting the initial shape right and from the looks of it, it might be an issue, I don’t know. I also want to of course make the rest of the handle less blocky and round it out. Hi there! If that blaster is your first try at SketchUp, then you did it quite well. I hope you’re using groups for those segments? Grouping makes the work neater. The curved edges of the handle can be done with the RoundCorner plugin. You need to install LibFredo companion library for the RoundCorner plugin to work. The top node is easier to build. Since it “sits” on the main body of the blaster, you can try drawing its profile and then Push/Pulling it. Would be great if you had more than one reference image (particularly a side projection view) but it’s not very important since most of the blaster is made from cylindrical shapes. Thanks for the plugin link! I’ll give that a try tomorrow when I’m at my computer. I’m not sure what groups are, so I assume I’m not using it. Will definitely give that a search and use it for future projects though. Not sure what you mean by push/pulling it. The detail is on the curved part of the blaster at the top, and it won’t let me push/pull on the curved surface. 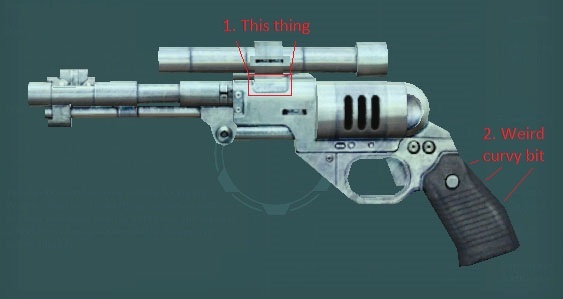 I want the lines within the red box I drew to be indented like the details on the rest of the blaster. I do have a few reference images that I could find. I just linked the main one that I was using. Here’s an album of the rest of my references.